ALLSELECTED is a powerful function that can hide several traps. This article is an in-depth analysis of the behavior of ALLSELECTED, explaining shadow filter contexts, what they are and how they are used by ALLSELECTED. We have created several articles about ALLSELECTED and, unfortunately, we have never been completely clear about its behavior. The reason is very simple. We fell into one of the many traps of ALLSELECTED: we believed we understood its behavior, but we were just so close – not there yet. After much time spent investigating its behavior and discussing this with the development team of Analysis Services, we finally managed to fully understand the ALLSELECTED function. This article describes its behavior. If you have read the first edition of the book, “The Definitive Guide to DAX”, consider this article an erratum of the book. Indeed, we are able to be a lot more precise and clear here, than when writing the book. We apologize for that. Last disclaimer, before we start the article: this is not an introductory paper about how to use ALLSELECTED. We are not explaining when to use the function and what to use it for. Covering just the internals of ALLSELECTED resulted in writing around 20 pages; adding an introduction would be out of the scope of this paper. This paper is intended for readers wanting a deep explanation of the internals of ALLSELECTED. ALLSELECTED can either return a table or it can remove filters and restore a previous filter context. In both cases, it does so by accessing and using the last shadow filter context left by an iterator on the stack of filter contexts. For now, the focus is on ALLSELECTED when used with a table or a column – later we will cover ALLSELECTED with no parameters, acting only as a CALCULATE modifier. Before performing a deeper analysis of ALLSELECTED, we need to introduce shadow filter contexts, as they are of paramount importance in the description of ALLSELECTED. Shadow filter contexts are a special kind of filter context created by iterators and, in their initial state, they are inactive. An inactive filter context simply stays there dormant, and it does not affect code behavior in any way. Still, it is there, and it is important for the sake of this article because ALLSELECTED activates shadow filter contexts as part of its execution. During the iteration, the row context on Color is not transformed into a filter context, as there is no CALCULATE performing a context transition. As explained here, there is indeed a filter context: the “shadow” filter context. The shadow filter context includes the list of colors that are active in the current filter context when the iterator starts. Indeed, the shadow filter context is not active during the iteration, unless it is turned on by a function – namely ALLSELECTED. In other words, it is safe to ignore the existence of shadow filter contexts, when not using ALLSELECTED. On the other hand, when the user decides to take advantage of ALLSELECTED, then shadow filter contexts are of paramount importance. In this case, the shadow filter context contains a selection of colors – namely, only red. However inside the iteration, SUM ( Sales[Quantity] ) still computes the sum of all the sales. If the shadow filter context were active, then the engine would only sum red sales. In this article, we refer to normal filters (that is, non-shadow filters) as explicit filters, with the sole purpose of differentiating between explicit filters and shadow filters when needed. Now that we know about shadow filter contexts, we can start analyzing the behavior of ALLSELECTED on sample data. On this table, we use an outer CALCULATETABLE to filter some colors and brands. We also apply an unusual measure, ListProductNames. ListProductNames uses CONCATENATEX to return the list of product names visible in the current filter context. The purpose of the measure is to let us analyze both the result of ALLSELECTED, when used as a table function, and the result of a table, when ALLSELECTED is used as a CALCULATE modifier. So far, there is nothing new. In the next sections, we are going to use the same code snippet with ALLSELECTED to analyze its behavior. ALLSELECTED ( Table[Column] ) returns the values of the column that were visible in the last shadow filter context that actually filtered the column. In the following code, we use ALLSELECTED on Product[Product] to retrieve the list of all product names that were visible in the last shadow filter context. Before moving further with the reading, one can try to guess what the result will be. Indeed, ALLSELECTED returns the values of a column as filtered by the last shadow filter context. The reader might have noticed that there is no active iteration when we call ALLSELECTED. Thus, there are no shadow filter contexts to activate. 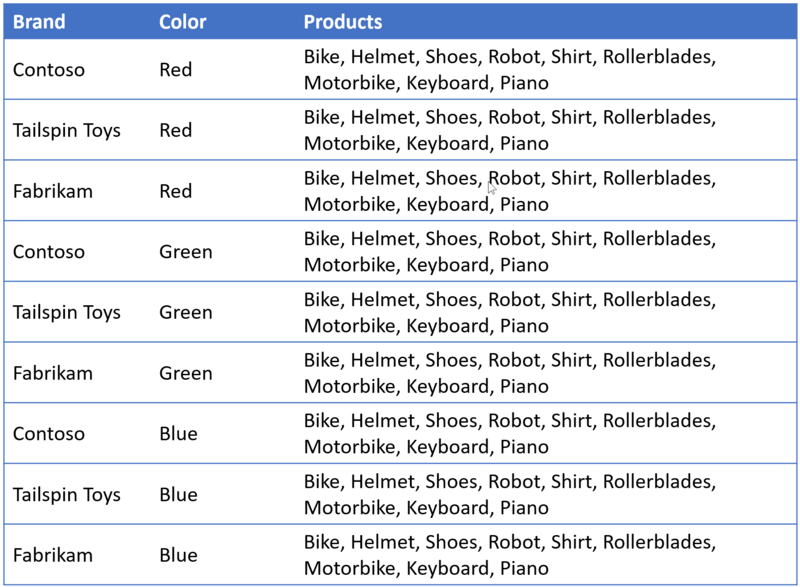 As a result, all the product names are returned because neither Color nor Brand filter the Product[Product] column – although it is cross-filtered. This is the first lesson to learn here: ALLSELECTED does not take into account the filter context. Its main purpose is that of retrieving a previously set shadow filter context. ALLSELECTED is very different from VALUES or DISTINCT. VALUES and DISTINCT always take into account the filter context, whereas ALLSELECTED does not. ALLSELECTED works on a column and checks whether that column is filtered by a shadow filter context, ignoring any cross-filter. This time the result will be as expected, namely: Helmet, Shoes, Keyboard, Piano. When we read it, we tend to think that this is because ALLSELECTED ( Product[Product] ) applied a filter on the Product[Product] column. But this is not what is happening. ALLSELECTED, in this case, does not apply any kind of filter to the Product[Product] column, because there are no shadow filter contexts. When called, it is VALUES that analyzes the products visible in the current context by observing the filters on Color and Brand. ALLSELECTED did not contribute to the filtering in any way. In other words, it is not ALLSELECTED that filters Product[Product], but the effect of cross-filtering from Color and Brand, made explicit by VALUES. 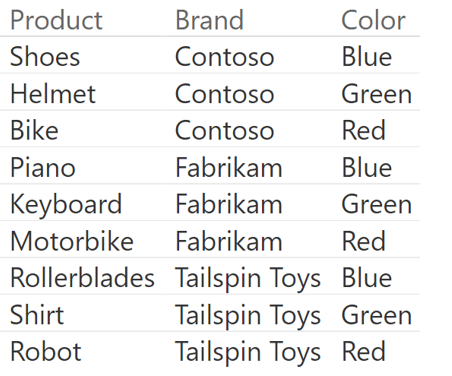 The result of this query is, as expected, two lines returning Contoso, Fabrikam for each brand. At first sight, it seems as if ALLSELECTED has restored the filter coming from the outer CALCULATETABLE. However, that is not the case although it returns the same result. What happens is that ADDCOLUMNS – which is an iterator – generates a shadow filter context containing the iterated table. 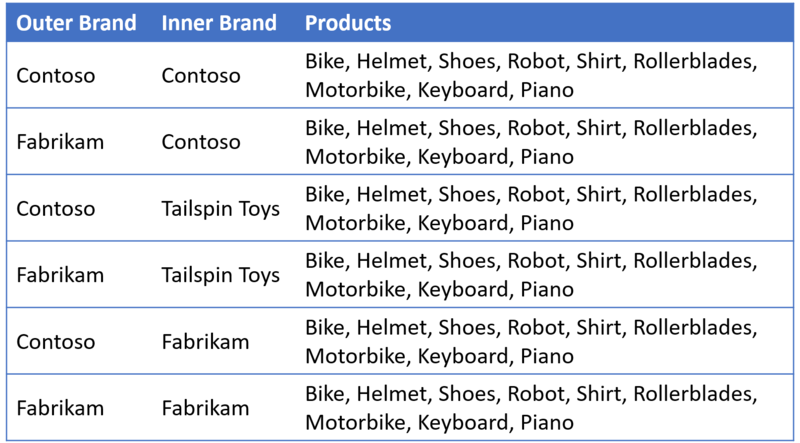 The iterated table is the result of VALUES(Product[Brand]) that – being evaluated in a filter context that contains only Contoso and Fabrikam – returns these two brands. The reason is that ADDCOLUMNS now iterates ALL(Product[Brand]). Thus, the shadow filter context contains all the values for Product[Brand]. When activated, the shadow filter context shows all values despite the outer CALCULATETABLE filtering only two out of three brands. The result, which we suggest the readers also test by themselves, makes visible only Contoso and Fabrikam, which are the brands in the outer filter context. As a reminder, using variables makes the code much easier to author and debug later: one must get used to them, as they play a very important role in complex DAX code. So far, we have deeply analyzed the semantics of ALLSELECTED when used as a table function with a single column. The next step is to add some complexity and use it with a full table as a parameter. Things start to get a little more intricate with ALLSELECTED ( Product ). 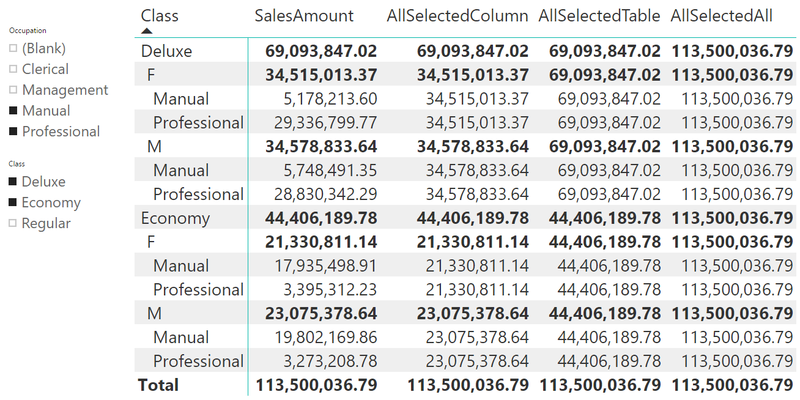 In fact, a table contains multiple columns. On each column, there might be an explicit filter – set with CALCULATE – or a shadow filter set by an iterator. Moreover, multiple filters – either explicit or shadow filters – can be nested on each column, making things even more complex. Let us start studying ALLSELECTED with a full table. 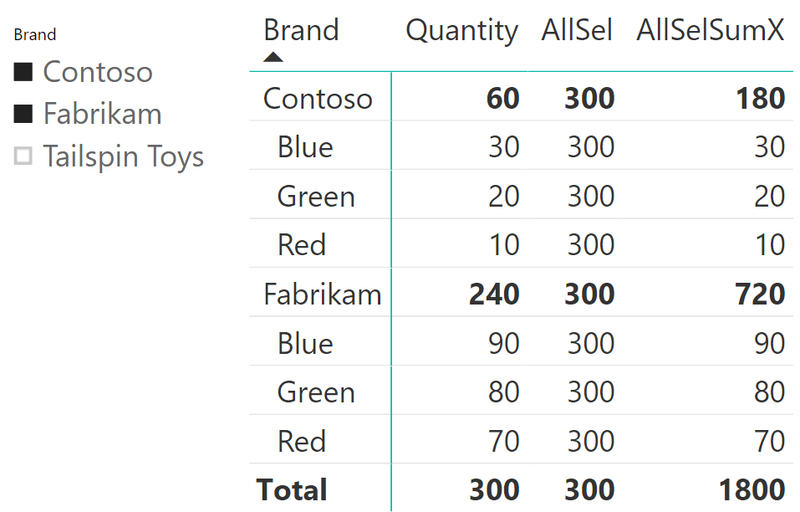 In other words, ALLSELECTED with a table used the explicit column filters created by CALCULATETABLE and returned only the products that are blue or green and Contoso or Fabrikam. The reader will note that in this first query, there are no shadow filter contexts. There are only explicit filter contexts. Since ADDCOLUMNS iterates on all the product colors, now there is a shadow filter context containing all the colors. This shadow filter context is activated by ALLSELECTED and it replaces the previous filter on blue and green. On the other hand, the Brand column – which is not filtered by the shadow filter context – still maintains the explicit filter on Contoso and Fabrikam. The result is the following, showing all the products that are Contoso or Fabrikam, in any color. In other words, the filter on Color is replaced, the filter on Brand is not. We suggest the reader look at the original data, to fully make sense of this complex result. 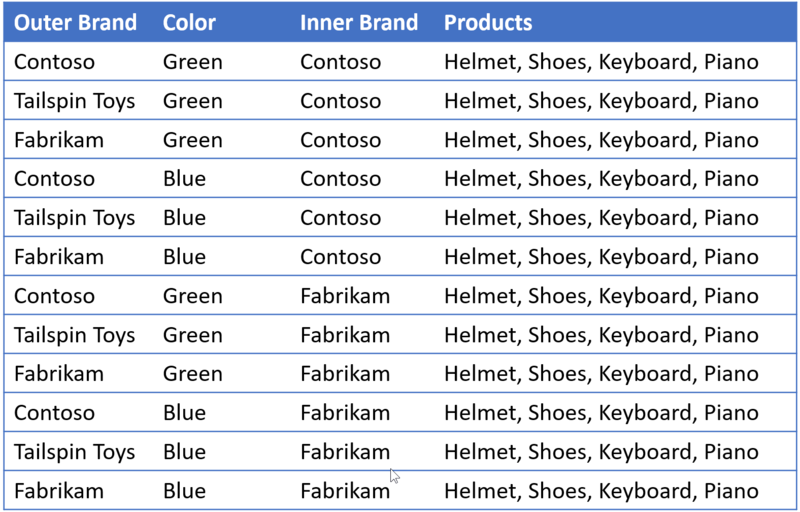 The result in the Products column of this last query is the list of all the products, because both Color and Brand explicit filters have been replaced by the corresponding shadow filters. Thus, ALLSELECTED restores the last shadow filter context on all the columns that have a shadow filter context, maintaining the explicit filter, if any, on the other columns. Let’s consider a summary of our findings so far. Iterators create shadow filter contexts. CALCULATE creates explicit filter contexts. ALLSELECTED is a table function that returns a different result when used with a table or with a column. With a column, ALLSELECTED returns the values of the column considering only the last shadow filter, if any. ALLSELECTED returns all column values if no shadow filter context exists. With a table, ALLSELECTED returns a table containing all the rows remaining after applying the last shadow filter on any column that has a shadow filter; or, ALLSELECTED returns the last explicit filter context if no shadow filter context is available. In fact, in the measures shown above, the external filter context is injected by VALUES, not by ALLSELECTED, as shown earlier. Moreover, ALLSELECTED operates in a similar way to ALL, which removes corresponding filters from the filter context when used as a CALCULATE modifier. The usage of ALLSELECTED with no parameter, when ALLSELECTED is no longer a table function, but only a CALCULATE modifier. Interaction between ALLSELECTED and context transition. In the total absence of parameters, ALLSELECTED is obviously not a table function. Instead, ALLSELECTED can be used only as a filter parameter of CALCULATE. Intuitively, it performs ALLSELECTED on all the columns that are referenced by some shadow filter context. In practice, restoring the last shadow filter context for each column. In the report, only Contoso and Fabrikam are selected, for a total of 6 products. The value of AllSel looks correct, since it reports, for each row, the total of Quantity in the matrix. The confusing results are in AllSelSumX: the only number that looks correct is the grand total (300×6=1800), whereas all the other numbers look wrong. 180 equals 60 multiplied by three; one iteration over the brand; three iterations over the colors; and, the innermost shadow filter context on color contains the three colors. This is not to say that the value shown for AllSelSumX makes any kind of sense. It is very likely that end users along with the reader, consider this number to be just wrong. Here, the goal is not that of finding a way to compute numbers properly. Instead we focus on understanding exactly how ALLSELECTED works, so that we rely on it and use it only when it produces what we need. In previous articles (Understanding ALLSELECTED) and, unfortunately, in the first edition of the book, “The Definitive Guide to DAX”, we described ALLSELECTED by saying that ALLSELECTED removes the last filter context generated by a context transition. Unfortunately, this was the wrong description. This calls for further explaining. Does ALLSELECTED interact with context transitions in any way? We know that CALCULATE generates a filter context equivalent to any existing row context as part of its filter context creation. We also know that this filter context generated by context transition has a lower precedence against any explicit filter context. Using ALLSELECTED as a CALCULATE filter argument means transforming a shadow filter context into an explicit filter context. This way, it gains precedence against the filter context generated by context transition. Thus, it looks like ALLSELECTED removes the last filter context generated by context transition. No such removal happens. The effect of removing the last filter context generated by context transition is only a side effect of the transformation of a shadow filter context into an explicit filter context. Once the semantics of ALLSELECTED are clear in terms of shadow filter contexts, explaining its behavior becomes much easier. As described here, the behavior of ALLSELECTED is easier to understand when one is more familiar with shadow filter contexts. With that said, ALLSELECTED is a very complex function because of the presence of shadow filter contexts, and because their interaction with the explicit filter contexts makes it very hard to elaborate on the results. 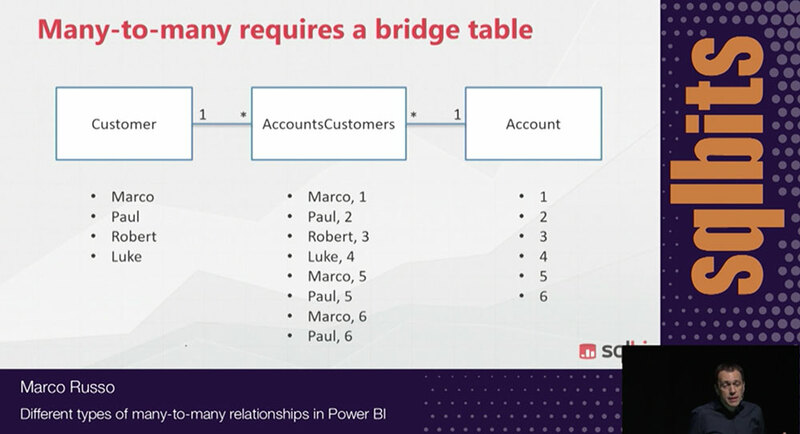 What we typically teach users during our trainings is to use ALLSELECTED to retrieve the query context – that is, the context under which a pivot table or a report is executed – if and only if no iteration is happening. If there are any number of iterations, users are encouraged to avoid using ALLSELECTED because the results are almost unpredictable. In reality, results are very complex to understand. This article presents all the tools needed to understand the behavior of ALLSELECTED. That said, we would not want to have to perform all these complex reasoning steps every time we need to debug a measure. 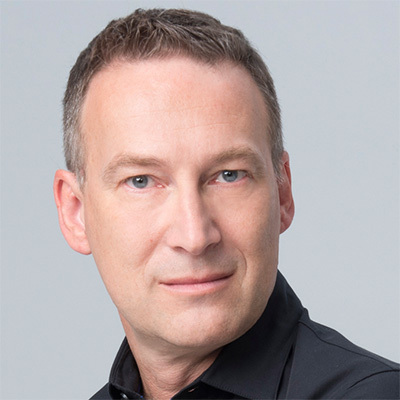 Thus, the suggestion still stands: ALLSELECTED should not be used inside an iteration, unless the user has established a very clear understanding of what they are doing and there is a strong need for it. In most scenarios, variables make it possible to avoid using ALLSELECTED inside an iteration. Variables are strongly suggested to that effect.